According to the schedule of the State Election Commission, Macedonian citizens abroad can submit an application for voting, personally signed or sent in electronic form to the diplomatic – consular offices (DCO). The citizen with the initials N.N who lives in Paris, France also wanted to exercise that right. After certain procedures through which the application has to pass from the Ministry of Foreign Affairs to the SEC, the SEC decides, within 48 hours, with a decision on the received requests and applications for voting abroad. Citizens have the right to file a lawsuit against the decision of the SEC within 24 hours, if the request has been rejected. However, in order for this to happen, citizens first need to receive a decision in which their request has been accepted or rejected. 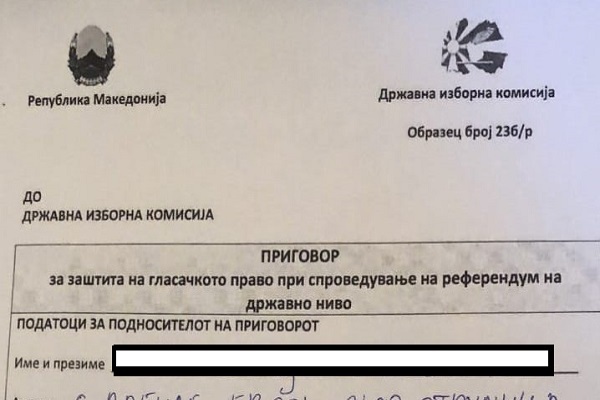 N.N who knew that she would not be in Macedonia on the day of the referendum, had accordingly, among the first, back in August submitted an application for voting at the referendum. She did not receive nether a confirming or negative response, and on September 29 in the morning went to vote at the Macedonian Embassy in Paris. “You are not on the Voters Register, you cannot vote”, is the result of her wish to exercise her right to vote. The next step in such a case is submitting a complaint to the SEC. Following a duly submitted complaint, she was promised a response within 4 hours. But, at 5.00 already nobody was answering the phone in the SEC, hours passed and yet there was no return email. At the end, she decided to contact them through Facebook. They gave her a reply that her case was being solved. After a short time, she received a reply that the decision regarding her complaint had been sent by email. Because she did not receive such an email, the SEC’s recommendation was for her to check in spam. The citizen tried to prove with a screenshot that she had not received anything by email. From this moment on, the SEC remains silent. If you check the list of complaints and decisions on protecting the personal right to vote, you will notice that there are no records that such an application has reached the SEC’s address or that they have decided upon that application. The single one complaint on September 29 is rejected, whereas the decision is still being processes. “Unlike the SEC, the DCO in Paris did everything they could to find a solution, but the SEC ‘couldn’t care less’ about this injustice”, commented citizen N.N angrily in a conversation with us. CIVIL has detailed information and photocopies of the application and the communication with the SEC and the Macedonian Embassy in Paris.